On the occasion of New Year of Expo 2010 Shanghai, the exhibition of A Gatherer of Light: Tada Minami opens. She won the Grand Prize at the 1st Henry Moore Grand Prize Exhibition in Hakone Open-Air Museum. She also was awarded Grand Prizes at Ube and Kobe open-air sculpture exhibitions. She has been one of the leading sculptors in the field of Japanese Sculpture since 1960. She perfectly combines new diverse materials of stainless steel, acrylic, glass, ceramics and titanium in her sculptures. Tada Minami and her Association developed in the glorious era of Japanese architecture. Tada Minami and her Association developed in the glorious era of Japanese architecture. Tada Minami and her fellows insist on creating both open-air sculptures and architecture-related artworks. She is also personally involved in creating most of her artworks. With her efforts, she drew the attention of the general public to environmental art. In addition to the selected new works of sculpture, this exhibition includes many photos of her representative architectures-related artworks. In 2009, the Japan Hakone Open-Air Museum celebrated its 40th Anniversary. Because of the deep relationship with her in art, Hakone Open-Air Museum organized a solo exhibition of Tada Minami as a commemorative project of 40th anniversary. The exhibition of A Gatherer of Light: Minami Tada in Shanghai is co-organized by Hakone Open-Air Museum and Shanghai Sculpture Park for the first time, which is also the first exhibition in China for Tada Minami. 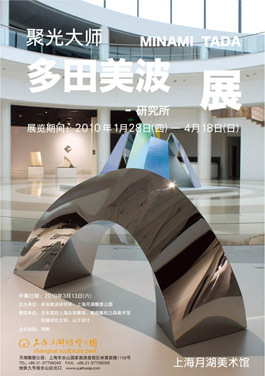 This exhibition is held in Yue Hu Museum of Art in Shanghai Sculpture Park. At this exhibition, in addition to the sculptures in Hakone Open-Air Museum 40th anniversary exhibition, her early bronze sculptures are exhibited, and all of which are very important works in her sculptures career. We are honored to be able to contribute to this exhibition, and hope to promote the bilateral cooperation in the development of art and culture by building a bridge of Chinese - Japanese exchange.